1. 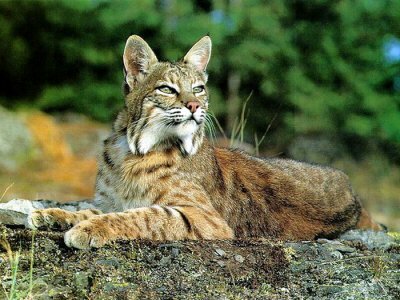 Bobcats are mainly carnivores and survive by hunting and eating rabbits, birds, bats, rodents and deer. They also eat lambs, pigs and poultry. 2. There are believed to be between 725,000 and 1,020,000 bobcats living in the wild today. 3. Bobcats generally have several dens that they use. One den they use as their main living area and they have other dens for shelter, storage and other purposes. 4. When a bobcat feels threatened, they will stay in their den for several days at a time before they come out. 5. It is not uncommon for bobcats to walk as much as 4 miles per day. 6. Bobcats can adapt to nearly any environment. Because of that, they can be found in many parts of the United States instead of isolated to certain climates and conditions. 7. Including their tail, bobcats generally measure about 4 feet in length. 8. Bobcats have several distinct markings that set them apart from other members of the lynx family, including a black-tipped tail that has white underneath it, hair ruffles on the face, and prominent ear tufts. 9. The gestation period for female bobcats is between 50 and 70 days. They can give birth to litter sizes ranging from 1 to 8 kittens, but most litters include between 2 and 3 kittens. Most kittens do not open their eyes until about 6 days after being born. 10. Bobcats living in the wild live an average of 12 to 13 years. In captivity, they have been known to live more than 20 years. 11. The breeding season for bobcats lasts from December to April. This is about the only time that males and females will spend time with each other as they prefer to live solitary lifestyles. 12. The bobcat will eats nearly anything, including rodents, deer, bats, beavers and other small creatures. However, one of their favorite creatures to eat is the rabbit. 13. A fully grown male bobcat can weigh between 16 and 28 pounds. Fully grown female bobcats weigh between 10 and 18 pounds on average. 14. The term “bobcat” was given because it describes the little “bob” of a tail that they have. 15. When a bobcat snarls or growls, it is done in such a deep tone that it sounds like it is coming from a much larger and fiercer animal. 16. To mark their territory, bobcats will use their urine and claw marks on the trees in the area. 17. Male bobcats are known as toms. Female bobcats are known as queens. A group of bobcats is called a clutter or a clowder. 18. Although bobcats prefer to stay on dry ground, they are great climbers and they can also swim fairly well. 19. Prices for bobcat skin can range from about $70 all the way to $1275, depending on the size and quality of the fur. 20. The sense of smell is lacking in the bobcat. This makes it difficult for them to smell approaching dangers and it makes it difficult to accurately smell for their prey. 21. Humans are prohibited by law to set traps specifically designed to catch bobcats. 22. The main threat to the bobcat population is human encroachment, meaning that forests and natural habitats are being destroyed to make room for homes and industry, which drives the bobcat population away. Disease is another main killer of the bobcat population. 23. Female bobcats reach the age of sexual maturity at about 12 months old. Male bobcats do not reach sexual maturity until they are about 24 months old. 24. The average height of a bobcat from the ground to their shoulder is about 14 to 15 inches. 25. Predators of the bobcat include mountain lions and wolves. However, owls, coyotes, foxes and eagles prey on baby bobcats since they are smaller.